Cold, blustery days aren’t the only days that are perfect for a roaring fire. If you’re a commercial firewood processor, you know that opportunities like these can drive business all year round. You also know that not every tool for splitting firewood is the same. When you sell firewood to other businesses, especially retailers, you need an industrial log splitter that can handle large volumes of wood as quickly as possible. Luckily for you, there’s plenty to look for in skid steer log splitters that can grow your firewood business into a roaring success. The skid steer splitters that we consider “traditional” use the most common mechanism available for splitting wood: a wedge that drives its way through the center of each log. No matter which style of traditional splitter you choose, it’s easy to figure out the best one for your business by asking a few simple questions. How good are the hydraulics on your skid steer? Skid steer log splitters power their attachments through hydraulic fluid or force. They achieve their highest levels of performance when the skid steer reaches either a recommended flow rate or recommended pressure level. Manufacturers will provide suggestions for flow rate and PSI levels—check to make sure that your skid steer can provide what your log splitter needs. Does the log splitter have an auto-return feature? The wedge on a splitter with auto-return will return automatically to the start position, which allows you to load or pick up the next log more quickly. When splitting logs is your business, that return time is money. Auto-return is an essential feature for any commercial firewood splitter. If your log splitter doesn't use auto-return, your skid steer will need to have a two-way hydraulic system to get the wedge back into starting position. It also can be fitted with what’s called a directional control valve, which will allow you to control the direction of oil flow and the position of the wedge from the skid steer’s cab. How large are the logs you’ll be splitting? Unlike cone-style splitters, most traditional skid steer log splitters are designed to handle logs between 24 and 36 inches in length and have restrictions based on log splitter tonnage. Logs longer than that won’t fit into the frame between the wedge and the base that holds the log in place. 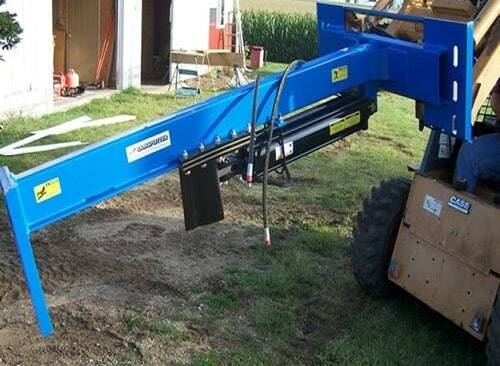 Because of their log size limitations and lower price tags, traditional skid steer log splitters are ideal for an individual setting up a small, local firewood business. However, they might not meet the needs of larger companies taking on bigger logs. 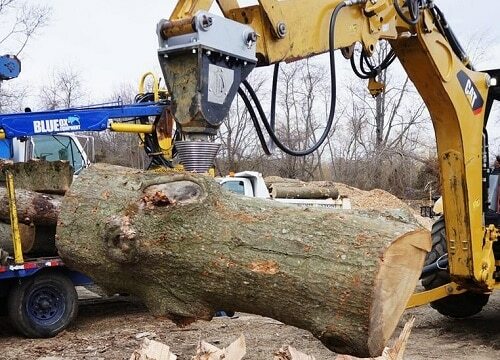 If you run a mid- to large-size commercial firewood operation, you’ll likely end up splitting trunks of fallen trees, or other logs far too substantial for a traditional skid steer splitter to handle. In that case, your best bet is to invest in a cone-style skid steer splitter. Because they work by drilling into a log, cone-style splitters can handle extremely large logs or downed trees. They don’t hold the log in place between a wedge and a base, so there are no limits on log length due to the splitter’s construction. Cone-style splitters also work quickly. The spiral thread that winds around the cone allows the cone to drill deeply into even the densest hardwoods with less resistance. But speed isn’t all that matters. Like the wedges on traditional skid steer log splitters, log splitting cones are replaceable. However, changing a cone is easy, with fewer parts such as a log splitter frame to get in the way. No matter the size of your business or logs, a powerful, efficient log splitter is just what you need to muscle through large loads of firewood and keep your customers well-stocked and happy. Whether a wedge-style splitter or a cone-style splitter best suits your business needs, you’ll find that a skid steer splitter will provide you with dependable strength and speed. That makes every day a good day not just for starting a fire, but for being a firewood processor. Skid Steer Log Splitters for Firewood Processors - Find Out How to Pick the Best Industrial Log Splitter. Our log splitter how-to library can help you pick the perfect electric log splitter, gas log splitter, 3-point hitch log splitter, skid steer log splitter or log splitter accessory.